With more than 1500 visitors, 80 shows and 100 guests queuing at one time for a screening, the swissnex Dome was a great success during the Swiss Innovation Week. The swissnex Dome is a full-dome structure that allows a 360° spatialization of images and sounds, taking the audience on a fully immersive and unique experience. 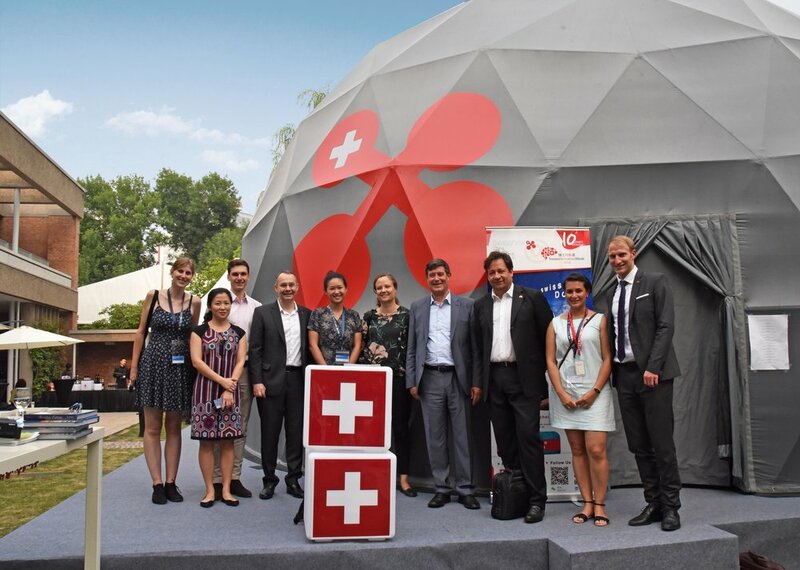 As the centerpiece of the Swiss Innovation Week, taking place from July 2 to July 6, 2018 and hosted by the Embassy of Switzerland in China (Beijing), the swissnex Dome particularly gained attraction with its dazzling outfit and put big smiles on the audience’s faces with the audiovisual experience presented inside. The swissnex Dome held its premiere night on July 2 during the Swiss Innovation Week’s welcoming cocktail event. Both the Ambassador of Switzerland as well as the Ambassador of Peru enjoyed the 360° cinematic spectacle away from the summer heat of Beijing. The temporary dome theater took two days to be set up by two engineers and six helpers. The film content proved to be innovative, entertaining and diverse: During the week-long event, two selected films from Geneva International Film Festival (GIFF), four works of students from the College of Art and Media of Tongji University, a special 360° flight footage from SOLAR IMPULSE, as well as the latest masterpiece of renowned Swiss film director Prof. Juerg Neuenschwander were featured in the swissnex Dome. We had the special pleasure and privilege of welcoming Swiss State Secretary for Education, Research and Innovation Dr. Mauro Dell'Ambrogio, movie actor Wang Xuebing amongst other high-profile visitors. Corinne Sutter, a prominent Swiss artist who presented a live painting show during the Swiss Innovation Week, also appreciated the diverse Swiss and Chinese creations in the swissnex Dome. The swissnex team with Swiss State Secretary for Education, Research and Innovation Dr. Mauro Dell'Ambrogio, joined by Dr. Beatrice Ferrari, Mr. Jonas Thürig and Mr. Laurent Feuz. The swissnex Dome was the most visited event during the Swiss Innovation Week and more than 1500 visitors enjoyed the films inside the Dome. During the Grand Reception on the final night on July 6, the waiting line for the swissnex Dome counted more than 100 guests. It was truly an honor to have organized the swissnex Dome, and even more rewarding when we hear the guests say ‘Thank you! It’s so cool!’ and see them leave with satisfaction. swissnex China will keep working on bringing interesting projects to the international audience with a combination of the latest innovations, science and technology. Our special thanks to swissnex Boston for their close collaboration and support for this project, and to Fulldome.Pro for the dome support. Please stay in touch and see you at our next event!